It is the 45th anniversary of the publication of S.E. Hinton’s 1967 novel The Outsiders , one of my favorite books of all time. Still, it is likely not what comes to mind when we think of good food stories. With Ponyboy and his brothers, Sodapop and Darry, living alone after their parents’ death, and their gang mostly fighting or trading insults with the rich kids on the other side of town, they’re much more likely to be rustling up trouble than grub. Into all this sensitive relaxation zooms Dallas Winston, bad boy extraordinaire, to bring them news . . . and bring them to a Dairy Queen. 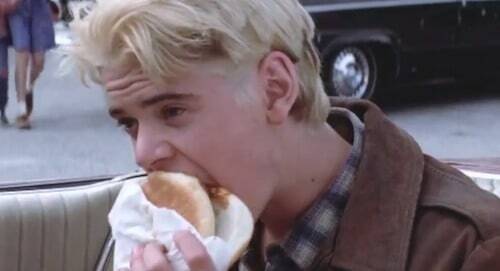 Maybe it’s partly because of the Coppola film version (1983), in which Ponyboy has barbecue all over his face, but the image of Johnny and Ponyboy shoveling barbecue sandwiches into their mouths after a week of consuming nothing but baloney and cigarettes has always stayed with me. Is there anything more companionable than friends joyfully eating (in a Thunderbird) and making plans—even if those plans center on the fallout of a stabbing? “We stopped at a Dairy Queen and the first thing I got was a Pepsi. Johnny and I gorged on barbecue sandwiches and banana splits. Johnny merely ate faster. I didn’t slow down until I got a headache” (74). “Johnny had been quietly finishing his fifth barbecue sandwich, but now he announced: ‘We’re goin’ back and turn ourselves in’ ” (77). Just like Johnny and Ponyboy are relieved to be able to shove fast food in their faces, in the summer when it’s hot and I’m hungry, I really welcome food that is satisfyingly easy to throw together. 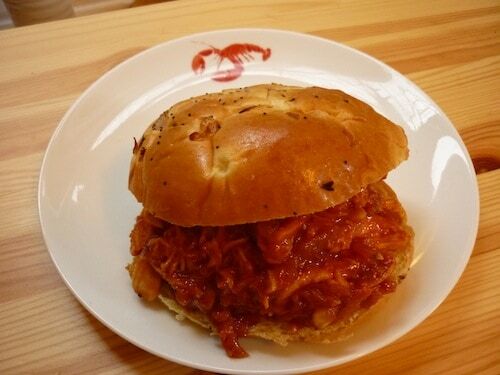 That’s why for these barbecue sandwiches I’m taking the fast and easy route with the chicken. I live in an apartment and don’t have a yard to grill in, so I’m using a roasted chicken from the grocery store, but if you’re lucky enough to grill often, this is a great way to use up that yummy extra barbecue chicken from your weekend cookout (or, perhaps, an impetus to make extra next time). Naturally, if neither of these appeal to you, just cook the chicken however you like; the sauce infuses the chicken so completely that you can’t really go wrong. And, of course, if you’d prefer to do pulled pork or another meat in place of chicken, go for it; the recipe is the same. As for the bun, I use onion rolls for my sandwich, but you could do hamburger rolls, Kaiser rolls, hoagie rolls, challah, etc. In a large stockpot, heat oil at medium-high; stir in the onion and cook for about 5 minutes until soft and starting to caramelize. Reduce the heat to medium and stir in the garlic and bourbon. Add the ketchup, Worcestershire sauce, Liquid Smoke, hot sauce, maple syrup, mustard, and sesame oil. Bring the sauce to a simmer and cook for 15 minutes or so, stirring often so it doesn’t burn. Add salt, pepper, and garlic powder to taste. If your sauce is too thick, add some water a little at the time; it should be about the consistency of ketchup. After your delicious barbecue sauce is cooked and seasoned to your liking, turn off the heat. Shred your chicken into the pot (I just use my fingers) and stir. Turn the heat back on for a few minutes and cook to let the flavors come together, stirring so the mixture doesn’t stick. Finally, prepare your sandwich however you’d like. I’ve gone the simple 1960s Dairy Queen route here, but they’re delicious with pickles, lettuce and tomato, sauerkraut, or potato chips on the bun. Stay gold, my friends. Stay gold.